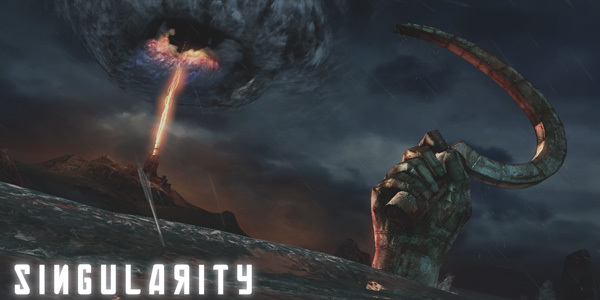 Singularity was largely ignored when it released in June last year, but after an impressive-looking trailer and finding out Raven Software (Soldier of Fortune 2, Quake 4) were behind it, I had enough reason to be intrigued. However, thanks to Activision’s new policy of “ignore it if it isn’t Call of Duty”, the game whimpered onto the market and sold about 7 copies. It took me until Steam’s Christmas sale to buy it because it wasn’t in any stores and the ones that did have it were stupidly overpriced, even online. Its a real pity because here is a game that has clearly been influenced by some of the most high-profile first-person shooters in recent years, and has managed to develop their ideas into a solid, entertaining experience, and one that deserves an audience. The opening sequence sees you and some fellow American soldiers being transported to the fictional Russian island of Katorga-12, where sneaky communists have discovered a powerful new element known as E99. After harnessing its power, they have been carrying out all manner of despicable experiments, creating deadly weaponry, and causing a rather inconvenient rift in time itself. Naturally, all hell breaks loose, and you become embroiled in a world of nasty mutants, evil scientists and those who are fighting to keep it all together. Armed with the hugely versatile Time Manipulation Device, you blast your way through about 8 hours worth of action, puzzle-solving and time-bending mystery. 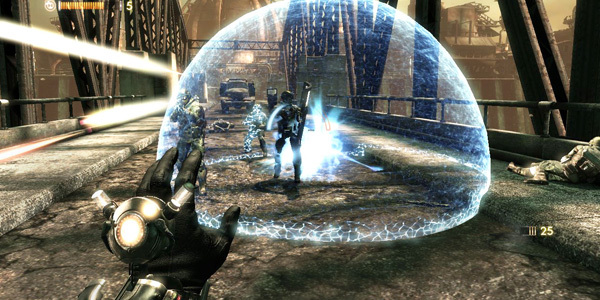 You can freeze enemies in this time-bubble. Fill the helpless fools with lead, then watch them fall down dead. So, about those similarities. The most noticeable influence is perhaps Bioshock, who’s audio diary collectible system has been borrowed and used here in almost the exact same way. You’ll find many broken recorders scattered about which, after being restored using the TMD, will give you a brief insight into some of the characters motives and backstory. The game also has a weapon upgrade system, whereby you spend E99 tech you find scattered throughout all the shelves, cupboards and hidden corners of the game. Its a simple system where you can upgrade the damage, clip size and reload speed of the weapons you find. Aside from the novelty value of using a remote-controlled grenade launcher and the near-useless spike gun, I found myself simply blasting enemies away with the standard machine gun and shotguns, both of which I had fully upgraded by the midpoint of the game. The second game I kept being reminded of was Half Life 2, but certainly not for its approach to storytelling. Both these games are remarkably well-paced, with a perfect balance of intense action followed by some calmer puzzle solving. Both game’s feature extensive use of physics, so naturally the TMD can also be used to manipulate objects. Whenever a game features a weapon that lets you pick up objects and then throw them at your enemies, who isn’t reminded of the one and only gravity gun? Still, it works well here for solving the odd puzzle and being a handy secondary weapon when you run out of bullets. Zapping various items in the world alters its age, effectively rotting, or restoring it depending on its current state. You’ll come across many broken staircases, crates and electric switches, all of which can be manipulated using the TMD. The final game it reminded me of was the classic Wolfenstein series. Like it, Singularity feels like an old-school shooter at times, with you blasting your way through enemies trying to get to the next checkpoint. Its mostly satisfying, and combat is solid, but it rarely excites as much as other contemporary shooters which have evolved to require a bit more skill from the player. In fact I only died once in the entire game (had I known it would be such a breeze, I’d have definitely upped the difficulty to ‘hard’ from the offset). Yet despite this lack of challenge, I never felt bored because the aforementioned pacing is so good, and because Raven have clearly understood what ideas these games did well. Its just that they haven’t quite managed to pull them off to the same standards. 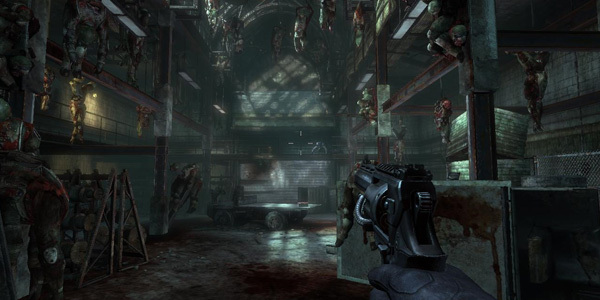 Powered by the ever-popular Unreal Engine, Singularity looks rather dingy on the graphics side of things. Every object you manipulate with the TMD is nicely animated though and there’s lots of fancy particle effects going on in virtually every scene. It can’t hide from the fact its a multi-platform release thanks to some muddy textures, but generally the game looks good throughout. I found it a bit strange that whenever a character speaks to you, they stare at one particular spot even if you are no longer standing there, and I encountered a bug where corpses sometimes would float horizontally through scenery until they were out of sight, but it happens so rarely its easy to overlook. This entry was posted in Game Reviews and tagged raven software, review, singularity. Bookmark the permalink.